In contrast to yesterday's Bateau Bus, here's something just a little bigger. 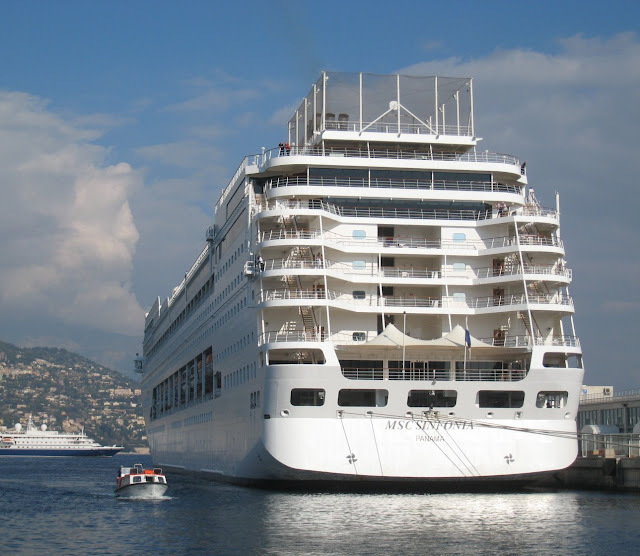 This is the cruise liner that was in port yesterday - MSC Sinfonia. She's an Italian cruise ship (so the food should be good!) with 777 cabins, accommodating 2087 guests. She's on a seven-day cruise between Italy, Tunisia, Malta, Spain and Monte Carlo. Wow, that's enormous! I've never really fancied a cruise myself, I think I'd find it a bit claustrophobic and artificial, but the ships are certainly impressive. Oops, sorry for the double comment! I just don't see how these things float without tipping over. They are all top heavy or seem to be. I don't think there is enough ballast in the world to keep some of them upright but I never see any news about one of them rolling over. I am really flabbergasted. I have been busy lately adding new segments to my website. I just added horses.